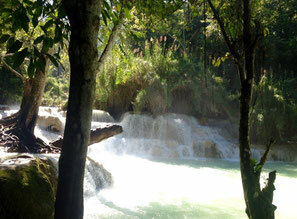 I spend around 2 weeks in Laos. The time there was very diverse and adventures. First, I went with a slow boat from Huay Xai (village at border in Laos) to Luang Prabang (I will do a separate blog post about this journey). 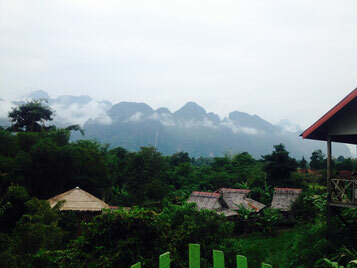 Then, I went with a mountain bike to Vang Vieng (also separate post :) ). 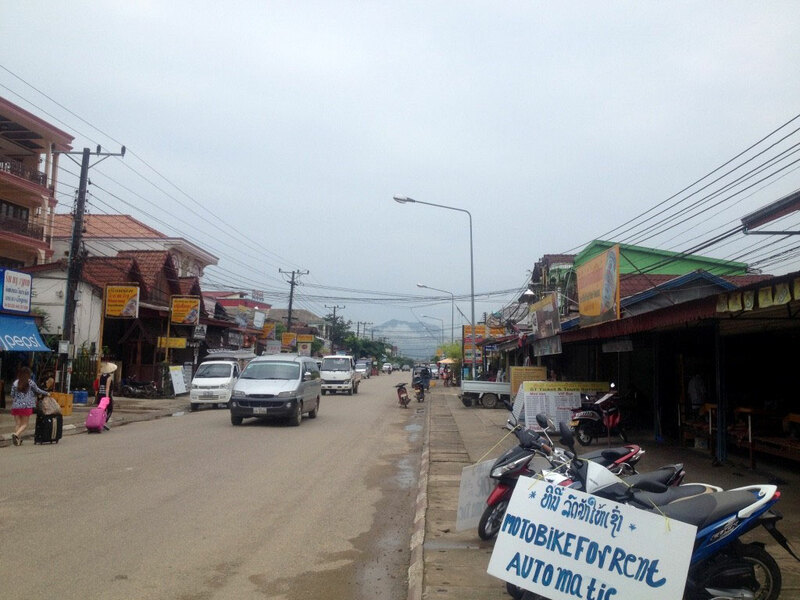 From Vang Vieng, I took a minibus to Vientiane and from there I took a plane to Vietnam, Hanoi. Luang Prabang was the place where I ended up staying for the longest time in Laos. Overall, I spend 5 really relaxed days there. In Luang Prabang you can still find the french influence with the architecture and the food. There were lots of bakeries that served croissants and baguette sandwiches. Every night, one of the main streets became a really nice night market. People sold lots of hand-made stuff, like scarfs and woodwork. You can find good and cheap food in the side streets of the market. They had buffets for 15,000 Kip, which is around $1,85. 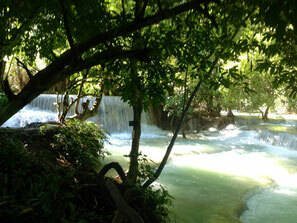 A little outside of Luang Prabang were several waterfalls. I went to the Kuang Si waterfall for a day. This one is the biggest one in the region and supposedly one of the nicest ones in all Southeast Asia. Luang Prabang also has lots of temples, just like a lot of other places of Southeast Asia. One of the differences was the feeding of the monks. Every morning, the monks went around to to collect food donations from locals and tourists. So, one morning I got up early to see the whole thing. Of course, on that day there was also a half-marathon in Luang Prabang and the monks ended up going earlier and they took a slightly different route than usually. That's why we ended up seeing only few monks. But overall, we saw how it works and we also saw a bit of the half-marathon. Next up was Vang Vieng. I only made a short stop there since there isn't too much to do. Vang Vieng is still one of the main destinations for lots of backpackers since it is a party town. The most known attraction there is the tubing, which essentially is just some kind of bar hopping. A bunch of bars are located at the side of the river and then you go on the tube from bar to bar. The most time you can spend on land in one of the bars and in total you are maybe 15min on the river, floating from one bar to the next one. 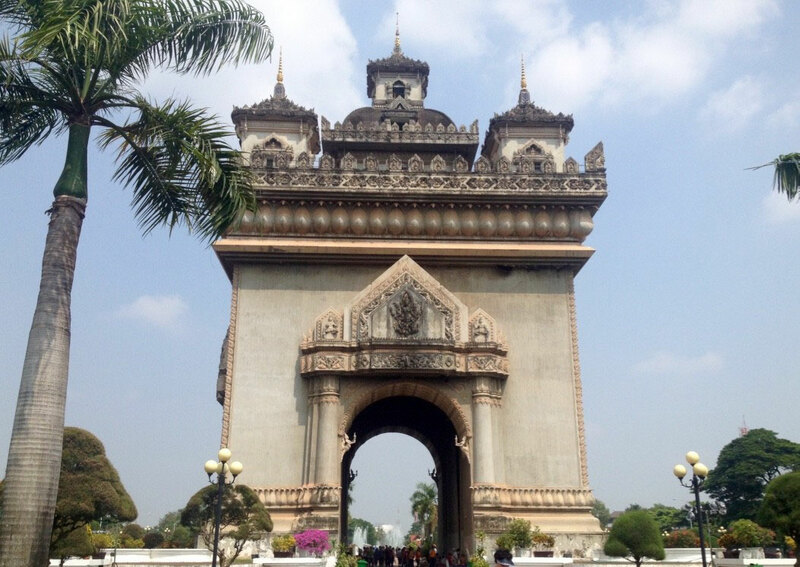 After Vang Vieng, I spend a couple days in Vientiane, the capital of Laos and waited for my flight to Hanoi. 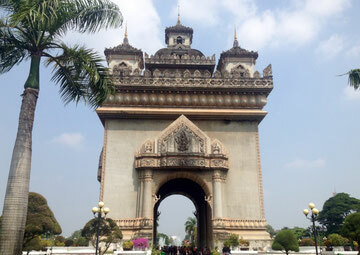 Vientiane isn't too exciting and there isn't that much to do, but you can still spend some nice days there. During my time there, I went to the history museum and the Patuaxai. The Patuaxai is a Arc de Triumph, that they build to celebrate the independence from France. Furthermore, there was also a night market in Vientiane. But it was the complete opposite to the one in Luang Prabang. The market reminded more of a state fair. Lots of lights, different music from every stage and people yelling and trying to sell their stuff. We only spend around 5 minutes there and then left again. From Vientiane, I took a plane to Hanoi and now I'm traveling through Vietnam for 2 weeks. I loved Laos! 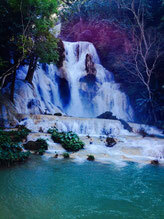 It was the first country I actually thought 'yes I could live here for a while" - that was in Luang Prabang. Trekking through the hills, sitting by the river, the whole atmosphere of this town amazed me! We ended our trip to Laos in the 4.000 islands. Also gorgeous. Such a relaxed feeling.